Amazon will spin out AWS and will also soon become the fastest-growing health care company in the world, predicts NYU professor and author Scott Galloway. Get ready for a wild 2019 for tech stocks and the FAANG names in particular. That's the message from NYU business school professor and author Scott Galloway, who made his annual no-holds-barred predictions for tech at Business Insider's Ignition conference in NYC this week. Galloway closely follows Big Tech and has written in his book "The Four" about the dangerous concentration of power and influence among the U.S.'s largest tech companies -- Apple (AAPL - Get Report) , Amazon (AMZN - Get Report) , Facebook (FB - Get Report) and Alphabet (GOOGL - Get Report) . Last year, he accurately predicted that Amazon would choose the Washington, DC area for one of its HQ2 locations, arguing that would clearly be the choice of CEO Jeff Bezos, who has a house nearby and owns the Washington Post. 1. Amazon will surpass Apple as the world's most valuable public company. Galloway had previously predicted this would happen in 2018, but still thinks it will happen soon (the current standing is Apple at $838 billion and Amazon at $816 billion). Galloway argues that Amazon's Alexa has replaced the iPhone as the most transformative device in the history of modern business. 2. Amazon will spin out AWS. This is Galloway's big prediction for 2019 or 2020; he argues that Bezos will make the move pre-emptively to forestall the government from moving to break up or otherwise regulate the company itself. Making it easier, Galloway argues, is the fact that Amazon now has another cash cow business that can replace AWS as a means of subsidizing its retail platform -- the media division. Galloway thinks AWS's valuation could vary a lot depending on which comps are used. 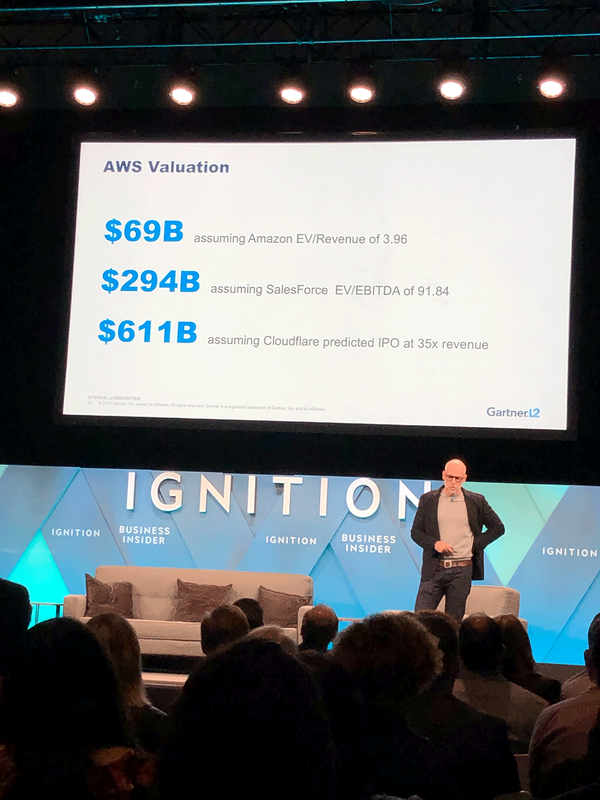 Once it happens, AWS will be one of the 10 most valuable companies in the world, according to Galloway, who predicts it could be valued anywhere from $70 billion to as much as $600 billion, depending on what comparable metrics you apply. "Spins work; throughout the history of technology, they tend to be very positive for shareholders," Galloway notes. 3. Instagram should also be spun out of Facebook. With Facebook's stock plunge this year, Galloway notes that it's now trading at a forward multiple similar to that of Coke KO and P&G PG, which are growing at just 6% a year vs. Facebook's 30% annual revenue growth. Despite Facebook being "bad for humanity and bad for the planet," according to Galloway, he also calls the company "likely the most undervalued stock in America." Spinning out Instagram would unlock value and create a company valued at anywhere from $110 billion to $470 billion. 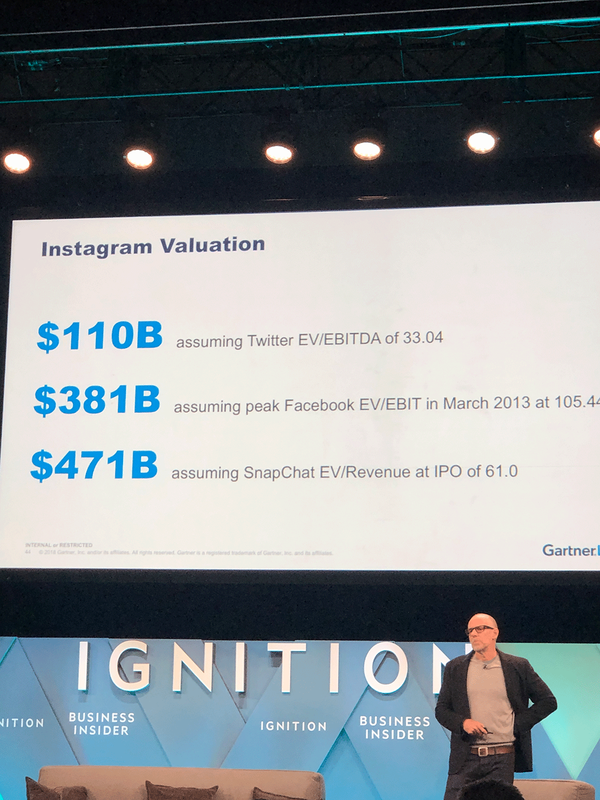 Instagram, too, would be worth plenty as a standalone company. 4. Europe will continue 'going gangster' on Big Tech. Galloway notes that Europe registers all the downside of Big Tech, including the weaponization of their elections, the anti-competitive behavior and avoidance of taxes, but only a fraction of the upside in terms of the jobs and wealth creation. As a result, we're seeing Europe levy fines against many big tech firms for anti-competitive practices and new revenue taxes being adopted. 5. The Big Four will continue uncoupling from each other in terms of stock performance. While they've tended to have been grouped together by investors, the four tech giants' stock moves have now started to diverge. Significantly, Galloway notes that Apple has come out of the recent challenges to Big Tech significantly better off reputation-wise than the others as a result of its stance of not trading on customers' data, opportunistic as that stance may be. 6. Amazon will soon become the fastest-growing health-care company in the world. Health care, with its high prices and customer dissatisfaction, is one of the industries most vulnerable to disruption, and tech companies are increasingly investing in both financial and human capital in the space. Galloway argues that of the Big Four, Amazon is best-positioned to profit here, particularly by selling health insurance, since it already has so much valuable data on its customers' habits. "They're very good at sitting on top of a large data set and deciding which businesses to be in and which to outsource," Galloway says. "That's a perfect fulcrum for an entry into health care." In addition, Galloway notes that "health care will demand extraordinary capital investments and losses in the short term -- Amazon has this as a core competency." 7. Mark Zuckerberg can and should be fired as CEO by a resolute board, and Sheryl Sandberg should go, too. While many view Zuckerberg as un-fireable given his control over the voting shares of Facebook, Galloway argues that he can be removed by a board that's determined to hold him to account for decisions that have resulted in a significant loss in shareholder value this year. According to Galloway, board members could join together to fire Zuckerberg as CEO and kick him up to chairman. Zuckerberg could then, in turn, fire the entire board, but then think of the reaction from the public and from regulators to such a move. "I don't think Zuckerberg will burn his castle to save it," says Galloway. Likewise, Galloway says COO Sheryl Sandberg should be fired as well, noting that she "failed to do her job and protect the commonwealth." How many of Galloway's 2019 predictions will end up coming true? Time will tell, but his past record has been pretty good so far. Amazon, Facebook, Apple and Alphabet are holdings in Jim Cramer's Action Alerts PLUS member club. Want to be alerted before Jim Cramer buys or sells AMZN, FB, AAPL or GOOGL? Learn more now.